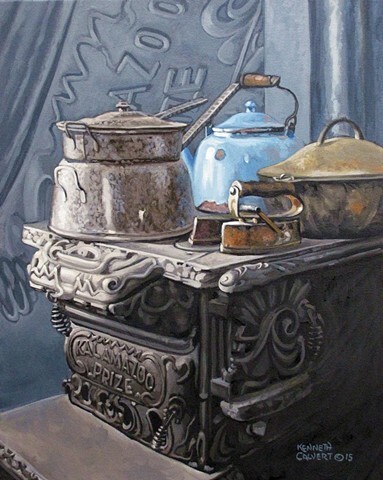 This still life in oils, features an ornate cast iron work of sculptural elegance by the Kalamazoo Stove Company. During the first half of the 20th century, the slogan "A Kalamazoo Direct to You" was one of the best-known trademarks in the nation. The Kalamazoo Stove Company helped put Kalamazoo Michigan on the map, keeping winter at bay and pots simmering, in homes all across the country.. Stoves like this were a presence in a room that modern appliances can never match.